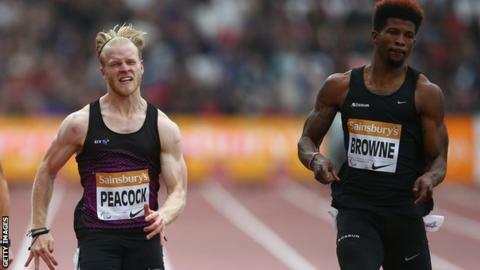 Richard Browne (right) once tweeted that Jonnie Peacock was a "great athlete, not so great person"
Double Paralympic champion Jonnie Peacock will face rival Richard Browne in the T44 100m at the Great North CityGames in Newcastle on Saturday. American Browne missed the 2016 Paralympic Games and 2017 IPC World Championships because of injury. It will be Peacock's last race before he takes part in reality TV show Strictly Come Dancing this autumn. The pair, who have dominated the event for the past six years, will race on a pop-up track in Gateshead. Peacock has won two Paralympic, two world and two European golds in the event, while Browne finished runner-up to Peacock at the 2012 London Olympics and won gold at the 2015 World Championships. The CityGames, held on the banks of the River Tyne, will also feature Britain's former European 110m hurdles champion Tiffany Porter, 800m runner Lynsey Sharp, world 5,000m finalist Andy Butchart and world 100m finalist Reece Prescod. The Great North Run, the world's biggest half-marathon, takes place on Sunday, featuring 57,000 runners. Britain's Four-time Olympic champion Mo Farah, who won a record third successive Great North Run in 2016, is among the elite athletes. He retired from the track last month to focus on marathons.